In the Game is bringing a heavy hitter to the Fall Expo in Toronto, hosting an autograph session with former Toronto Maple Leafs fan favorite, Wendel Clark. He will be at the show on Sunday, November 13th to meet with fans and sign items. Collectors will get a voucher to see Clark when they buy a specially marked box of 2011 In the Game Decades - the 80's. The company will also be rewarding box breakers with one of ten special redemption cards exclusive to the show. The redemptions have a distinct Maple Leafs flavor. A total of 400 redemptions will be available at the show. 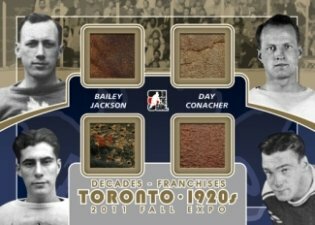 The Fall Expo is one of Canada's biggest sports card and memorabilia shows. Running November 11th to 13th, the event has more than 900 tables.